Birds can be an invitation to fly wild and free, or they can be a symbol of cozy nests and cheerful, early morning songs. Flocks of geese winging their way across the sky remind us of seasonal change and a journey to follow warm weather and the sun. Metal is an enduring substance that can be shaped into almost anything. It can be imbued with added color or it can be displayed in its own natural tones. Dark metals can be displayed against white or light-colored walls, while light or shiny metal works well against dark walls, such as mahogany paneling. Most metals are a naturally heavy substance, yet birds can be formed using metals. Bird forms made of metal are enduring. There is something fanciful about creating a shape so fleeting and fragile as a bird into something as heavy and unmoving as metal. Even aluminum has greater weight than the fragile hollow bones and feathers that characterize most birds. There’s a delicious irony in using metal sculptures to depict the wild, free flight of birds and a little use of optical illusion can be applied to emphasize three-dimensional effects on flat surfaces. An even more charming use of metal birds, however, is to suspend them on wires from your ceiling or from trees out of doors. Displayed in this way they can appear to be flying, just as do their counterparts, the wild birds that are so fragile yet so crucial to our ecosystem. Below you will find ten metal bird wall décor options. These birds will not fly away with the seasons. They will fly from your wall, ceiling, tree or fence in perpetuity or until you tire of them. They combine the durability of metal and the wild, free feeling you get when you watch a flock of geese flying overhead. With these metal birds, however, you will not have to wait for autumn or spring to see them winging their way through your spaces. These black birds fly in a three-dimensional formation, mounted on the wall they appear to be flying towards you. Working well with a light wall the birds can bring together your dark tone décor with a bright room, adding balance to it. For an added effect, try adding this piece in front of a mirror. These silver birds mount on your wall and work with many modern styles. The silver is bright and can add to a light surface or stand out a lot on a dark wall. The trim of the birds is black adding body and definition letting them work with darker toned décor. If you want more of an aerial feel, try putting these on the ceiling. These birds appear to be holding the metal support rod that holds this décor up. The blue and gold birds will work well in a light tone area or in a green area by hanging plants or can be hung with the pots. The ten birds are flying in a line formation through the air as they travel on their way. These birds have a brown and silver finish, and add color to this flock making it stand out against your wall and catching the light nicely with its high gloss. The three-dimensional design will bring eyes quickly to this décor and others around it. The birds are in a diving motion, making people that sit under this décor look up constantly. 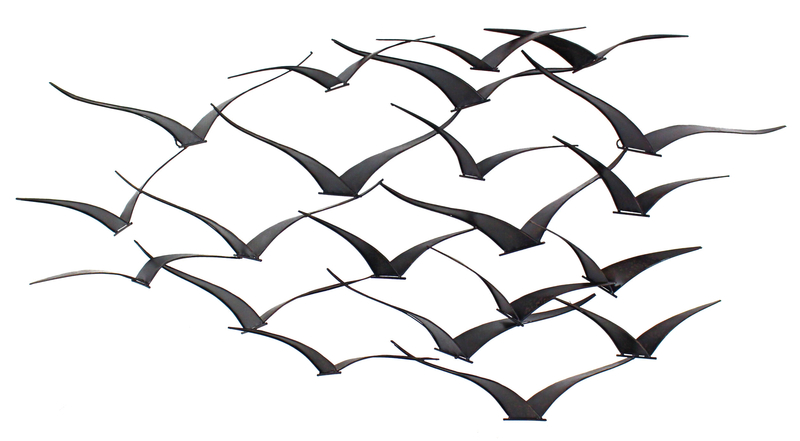 These metal bird silhouettes look like they are flying out of your wall towards you with their three-dimensional build. The beige finish works well with light-toned wall and will enhance the birds by adding a visible shadow behind them. The effect will bring people to this décor wondering how it’s mounted. The brown finish on this birdcage wall décor works well with many wall styles. With the white center looking at this piece you are not sure if there’s a real cage there or if it’s flat with a bird in the cage. This question quickly will bring attention to this piece as people will want to know, bringing out your precious décor around it. These five blackbirds come separated so you can position them where you please, having them fly wild or in formations. The dark grey finish stands out against any wall bringing a sense of motion to it with the three-dimensional birds. With minor modifications, you can hang these birds from your ceiling, letting them fly freely. This flock of birds can fly where you please on your wall. The black metal stands out against any lighter wall with lighting facing towards it. The abstract style is great to bring a natural feel to any modern styled room or area. Having the light on the right side of this piece makes it look like your birds are flying to the setting sun. This piece is round with branches in the center reaching out towards the sunlight with a bird resting on one of the branches. The black metal stands out against a white wall as if hung slightly away, making a nice shadow on your wall. With a weatherproof finish, it also works well outdoors on a light fence or hanging free. These metal birds have a bronze finish that makes them stand out against a light tone or white wall. The four silhouettes of the birds bring an eye to them quickly enhancing your décor. The flat nature of this piece with a little work can sit nicely in between glass on a coffee table, making people wonder how it was made.